Cadburys Temptations . Deliver this lip smacking and delicious bar of Cadburys Temptations (2 Bars 72 gms each) to your friends and relatives with 1 Regular Rakhi and Roli Tilak Chawal. Cadburys Temptations . 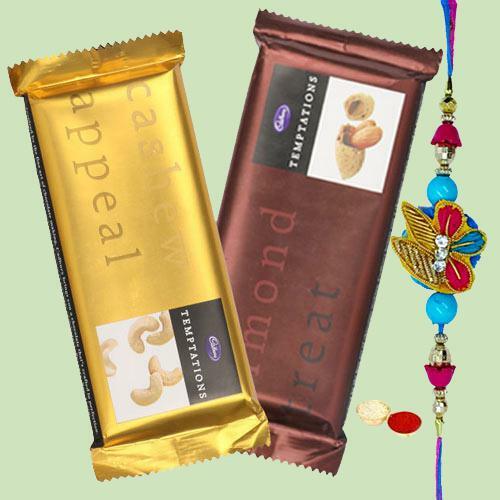 Deliver this lip smacking and delicious bar of Cadburys Temptations (2 Bars 72 gms each) to your friends and relatives with 2 Regular Rakhi and Roli Tilak Chawal. Cadburys Temptations . Deliver this lip smacking and delicious bar of Cadburys Temptations (2 Bars 72 gms each) to your friends and relatives with 1 Bhaiya Bhabhi Rakhi and Roli Tilak Chawal. Cadburys Temptations . Deliver this lip smacking and delicious bar of Cadburys Temptations (2 Bars 72 gms each) to your friends and relatives with 1 Family Set Rakhi and Roli Tilak Chawal.